Some of the cheapest Lotus Driving Experience Days from Greatest Gifts. 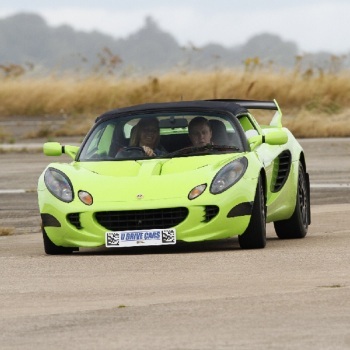 Get out and enjoy a Lotus Driving Experience Day at tracks around the country. Treat a loved one to a fabulous Lotus Driving Gift for an unforgettable Supercar driving experience track day. Lotus began manufacturing way back in 1952 as Lotus Engineering Ltd. Founded by Colin Chapman, it all started in an old stables behind a hotel in Hornsey, London. The company moved to Cheshunt in 1959 and since 1966 production has been at Hethel in Norfolk. Being an old RAF base this was absolutely perfect, as the runways that used to be for aircraft became part of the track for car test runs. In the 1980's the company massively increased their exports to the USA through Lotus Performance Cars Inc. The Giugiaro-designed Lotus Turbo Esprit was a major factor in these record sales to America. This success led to Lotus being acquired by General Motors who eventually sold it to a Luxembourg company in 1993. Since 1996 the Malaysian car company, Proton, has owned the brand which keeps the Lotus Driving Experience alive and kicking. The most famous Lotus is probably the Elise. The most recent models have an aluminium frame and composite body shell. The Supercharged model, the Lotus SC, is capable of 0-60mph in just 4.3 seconds. The coupe version of the Elise is called the Exige and was introduced in 2004 with a 1.8L Rover very high performance engine. This was replaced in 2007 with a 16 valve Toyota/Yamaha engine. In 2005 a Supercharged Exige was developed which could do 0-60mph in just 3.9 seconds and achieve a top speed of 155mph (249km/h). The Evora was introduced in 2008 with a top speed of 162mph (261km/h) and 0-60mph in 4.9 seconds. Team Lotus competed successfully in Formula One racing until 1994, winning the World Championship seven times.